Dimensions 0.25 by 5 by 7.50 in. In this sequel to "Karneval in KÃÂ¶ln", Dino is making his way into the heart of Munich, capital of the Free State of Bavaria and home of the world-famous Oktoberfest. Bewildered by the Bavarian dialect and trying to get his head around local cuisine and customs, he finally lands a steady new job in a legendary location. But it's only so long before a new acquaintance and the world's largest funfair catapult him out of his everyday routine. Explore the wonders of Munich in the autumn, learn about local sights and sounds, and improve your German effortlessly along the way! This book is designed to help beginners make the leap from studying isolated words and phrases to reading (and enjoying) naturally flowing German texts. Using simplified sentence structures and a very basic vocabulary, this collection of short stories is carefully crafted to allow even novice learners to appreciate and understand the intricacies of coherent German speech. Each chapter comes with a complete German-English dictionary, with a special emphasis on collocative phrases (high frequency word combinations), short sentences and expressions. By working with these Ã¢ÂÂbuilding blocksÃ¢ÂÂ instead of just single words, learners can accelerate their understanding and active usage of new material and make the learning process more fluid and fun. 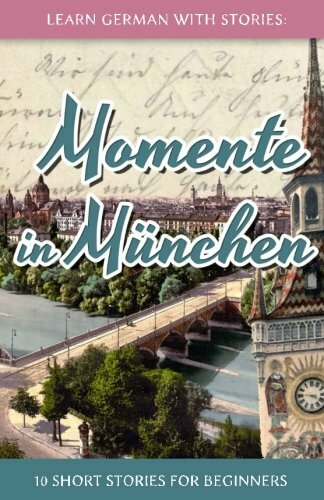 Bilingual edition from Createspace Independent Pub (November 17, 2014); titled "Learn German With Stories: Momente in MÃ¼nchen: 10 Short Stories for Beginners"
About: In this sequel to "Karneval in KÃ¶ln", Dino is making his way into the heart of Munich, capital of the Free State of Bavaria and home of the world-famous Oktoberfest.